Delivering more-effective boiler replacements — Stuart Turner. It sounds simple but all too often building owners/operators do not know their current energy costs and gas consumption. When I visit a site to look at heating or hot-water systems I ask two questions. • What does the equipment supply? • Have you ever run out of hot water? This helps to identify if there have been changes in the building being supplied and whether there is a need to reduce or increase the size and number of installed boilers or water heaters. Modular boilers installed at Walton Community Hospital alongside calorifiers to provide the heating and hot water for the hospital. The condensing modular boilers were chosen to replace old gas atmospheric boilers due to their greater efficiencies and vertically stacking design that could supply 600 kW output from a small floor space. A school I visited to review their boilers was a classic example of why you cannot simply replace without reviewing the current situation. The school had two 1500 l calorifiers being heated by a 400 kW boiler. When I enquired about what the calorifiers were supplying, the answer was ‘Four wash basins and a shower’. It turned out the school had decentralised its plant room five years prior, but the main calorifiers had been left to run as before. The school was able to remove the boiler and both calorifiers — perhaps not good news for us, but the school is definitely seeing the savings now! Once we have examined the current situation we can look at ways it can be improved. Many older heating systems are operating on two or three large-output steel shell boilers, particularly in large buildings with high heat demand. These boilers can provide the heat that is required but may not be as economical as, say, seven or eight smaller output modular boilers. But why is this? A heating system should deliver the right amount of heat at the right time in the right place, otherwise energy is wasted. Using single or multiple boiler systems with high turndown ratio allows for closer load matching with resultant improvements in system operating efficiency, therefore lowering gas usage and fuel costs. Plus, overall emissions will be reduced due to less over-firing of the appliance. Legislation will drive product choice, but not system design. With the Energy Related Products Directive (ErP) now in force it is not possible to replace atmospheric or non-condensing boilers like for like — a condensing boiler will have to be installed. The ErP directive sets minimum requirements for products that use energy. 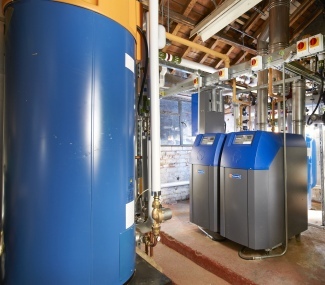 Boilers up to 400 kW need to meet the efficiency levels that are only achievable with a condensing boiler. But what the directive fails to recognise is that condensing boilers only achieve these efficiencies if installed, set up and controlled in the most effective way. In other words they need to be in a system where they are working in condensing mode (return temperatures to be at less than 54°C for the boiler to actually start to condense), otherwise they will only achieve marginally better efficiencies than a high-efficiency non-condensing boiler. But the benefits of modular boilers are not just financial. For the right building, modular boilers represent a more secure and flexible option. They are best suited to buildings with significantly variable heat demand such as schools and offices. 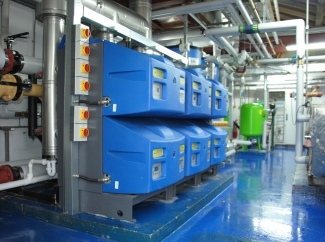 At this hospital in Surrey, the number of boilers was reduced from three atmospheric boilers to two fully modulating condensing boilers. The new boilers are more efficient, have a higher turndown ratio to enable accurate load matching, plus there will be a corresponding reduction in service and maintenance costs from reducing the number of boilers. Using multiple boilers increases system security. The building can still be heated sufficiently in the event of a module breakdown without putting the building at risk. This makes the modular solution very popular in the health sector, which relies on heating and hot water to be able to operate safely. In the same vein, servicing modular boilers is much more convenient, as one module can be serviced while the others continue to meet the system demand for heat. Modular boilers have advantages for installation too, due to their flexible construction and size. Installing smaller modular boilers is physically easier than very large boilers, and ongoing access and handling is not a problem, even in the most compact boiler rooms. Plus, for retrofit projects they are often installed alongside the existing boiler. This helps to ensure a smooth changeover from old to new with little or no system downtime. We know it is quite possible to achieve real, tangible savings right away by upgrading boilers to newer more efficient, condensing modular boilers that can closely match the heat demand of a building. Teaming this up with the correct control strategy presents quite an attractive proposition to reduce fuel bills and help contribute to Government targets on reducing carbon emissions.